In recent years Mexico City has rapidly implemented a series of livable streets investments including bike lanes, a bike share system, pedestrian streets, pedestrian crosswalk improvements, and pocket parks. These investments, while positioned by the municipal government as a method to reduce the consequences of automobility and increase urban equity, often reinforce the extreme socio-economic divisions that have always characterized the city through their location in primarily wealthy and/or gentrifying neighbourhoods. Through a series of semi-structured interviews with planners, we document livable street investments made in Mexico City from 2007 to 2016. We focuses on the convergence of three main forces that have led to the uptake of livable streets, namely the growing professionalization of the city’s civil society, the hiring of creative class planners, and the creation of new municipal government departments. We highlight the emergence of livable streets as part of a competitive city economic development strategy and argue that livable streets fit comfortably into a larger planning system that favours the neighbourhoods with the most economic potential, unintentionally reinforcing extreme socio-economic divisions. Ryan is an urban sustainability planner and current PhD student in Planning in the Department of Geography and Planning at the University of Toronto under the supervision of Paul Hess. 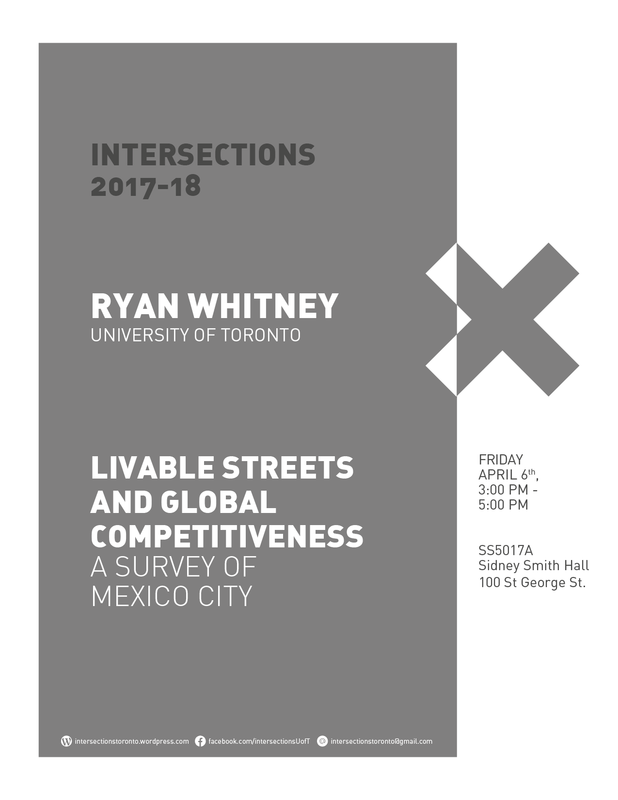 Previous to beginning his PhD, Ryan worked for 8 years on policy development to support the planning of cities that are safe and accessible for pedestrians and cyclists in a variety of international contexts. His dissertation research focuses on the uptake of urban sustainability best practices in the context of equitable urban development in Latin America, with a specific focus on Mexico City. Ryan has a has a MSc in Geography, Urban, and Environmental Studies from Concordia University in Montreal.